Many poker players ask about how to mark cards themselves, and they find invisible ink pen kit. But they do not satisfy with the effect, they need something more professional. We tell them we have invisible ink cards marking printer on sale. 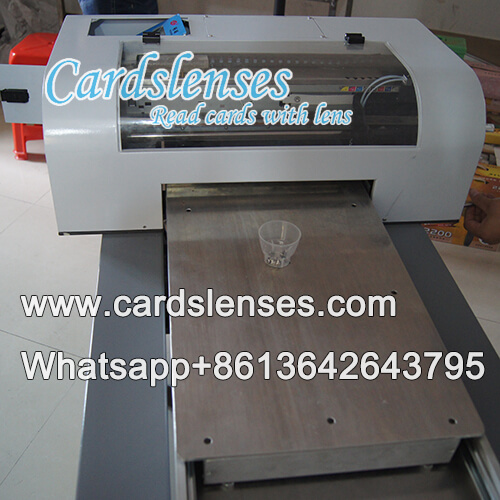 This invisible ink marked cards printer can mark any kinds of playing cards, paper, plastic, poker size and bridge size cards deck. Before you start to print, you need to check the invisible ink if enough for the playing cards you going to print. And check the luminous ink is for contact lenses or for IR poker camera. After then, you just waiting for your IR invisible ink marked pack of cards.